Rosie. Photo courtesy of ABC. 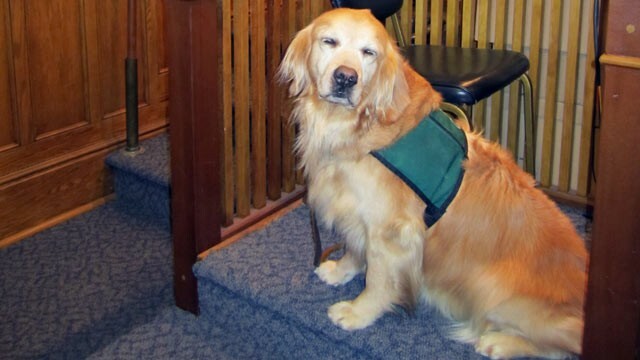 Cheers to ABC for this article about a Golden Retriever named Rosie, who became the first service dog to help a witness testify in a New York State court. Rosie calmed a 15-year-old girl in Poughkeepsie, allowing her to testify about being sexually abused for four years. Her testimony persuaded jurors to find a male perpetrator guilty. The main was sentenced to 25 years to life in prison. Licensed clinical social worker Lori Stell cared for the young victim and testified for permission to allow Rosie to be with her on the witness stand. “A lot of time when children have been exposed to trauma or sexual abuse, they have a hard time expressing themselves,” Stella said. To learn more about how social workers help victims of violence and disasters visit the National Association of Social Workers “Help Starts Here” Family Safety Web page by clicking here.